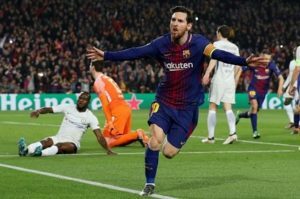 FC Barcelona clinched a spot in the Quarter-Finals of the UEFA Champions League for the 11th consecutive season after eliminating Chelsea thanks to a 3-0 victory at the Camp Nou following their 1-1 draw in London. The Blaugrana opened the scoring after two minutes of passing the ball amongst themselves before Messi slotted the opening goal between the legs of Courtois. In the 20th minute, Barça doubled their lead when Messi went from goal scorer to goal provider after squaring the ball up to Dembélé who blasted in the much needed insurance game to make it 2-0. This was the big summer signing’s first goal as a Barça player. Messi scored the third and final goal of the match in the 63rd minute to make it 3-0. That goal was his 100th goal in the Champions League. Barça will learn who their opponent will be in the next round on Friday when the draw is made. The other teams remaining in the competition are: Real Madrid, Sevilla, Juventus, Roma, Manchester City, Liverpool and Bayern Munich. Barça will now prepare for Sunday’s clash against Athletic at the Camp Nou. FC Barcelona: Ter Stegen, Sergi Roberto, Piqué, Umtiti, Alba, Sergio Busquets (André Gomes, 60′), Rakitic, Iniesta (c) (Paulinho, 56′), Dembélé (Aleix Vidal, 67′), Messi & Luis Suárez. Chelsea: Courtois, Azpilicueta (c), Christiansen, Rüdiger, Moses (Zappacosta, 67′), Kanté, Cesc Fábregas, Marcos Alonso, Willian, Hazard (Pedro, 82′) & Giroud (Morata, 67′). Goals: 1-0 Messi (min.2); 2-0 Dembélé (min 20); 3-0 Messi (min 63). Cautions: Sergi Roberto (22′); Willian (45′); Giroud (49′); Marcos Alonso (75′). Previous PostBarça remain unbeaten after 2-0 victory in Málaga. Next PostBarça remain unbeaten after come from behind 2-2 draw.